Zion Market Research has published a new report titled “Blockchain Identity Management Market by Deployment (Public, Private, and Hybrid Cloud), by Application (Multi-Factor Authentication, Password Management, Access Management, Directory Services, and Others), and by Vertical (BFSI, Retail, Logistics, Healthcare, Government, IT and Telecom, Media and Entertainment, Travel and Hospitality, and Others): Global Industry Perspective, Comprehensive Analysis, and Forecast 2017-2024’’. 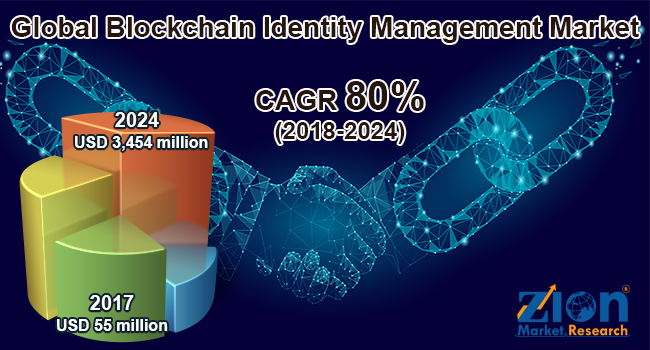 According to the report, the global blockchain identity management market was valued at around USD 55 million in 2017 and is expected to reach approximately USD 3,454 million by 2024, growing at a CAGR of slightly above 80% between 2018 and 2024. Authentication, storing, and revealing of digital identity is a vital element in the current data-driven world. Blockchain technology acts like an immutable ledger, where information of each transaction is stored in different data blocks, which is used to develop a safe, secure, and transparent tool for identity management. This blockchain-based identity management system provides various advantages across varied verticals. The blockchain identity management systems offer multiple benefits to its users, such as speedy transactions, elimination of malicious activities, and prevention of data breach. Owing to the increase in recent hacker attacks, various global organizations are opting for blockchain identity management solutions to ensure the protection of their customer data from online frauds and digital clones. Blockchain identity management system aims at providing control of user identity. The decentralized mechanism implied in this system plays an important role in securing and managing individual's or organization's data. The benefits offered by blockchain-based identity management system include better security and improved end-user experience, reduction in redundant compliance steps, and ability to meet global privacy/identity requirements. Tech giants, such as IBM, are striving hard to prevent data frauds of their clients. The rising demand for self-sovereign identification and KYC simplification are certain factors fueling the global blockchain identity management market. Furthermore, digitalization of business and processes are likely to drive this market in the future. However, the lack of common regulatory standards and privacy issues might restrain the future of blockchain identity management market globally. Nevertheless, the increasing application and implementation of blockchain-based identity management solutions in BFSI sector are projected to create new opportunities in the blockchain identity management market in the upcoming years. The blockchain identity management market by segmenting the market based on deployment, application, and vertical. By deployment, this market is divided into the public cloud, private cloud, and hybrid cloud. Private cloud is anticipated to register substantial growth in the future owing to its ability to provide good security as compared to a public cloud. By application, this market is segmented into multi-factor authentication, password management, access management, directory services, and others. The multi-factor authentication is projected to hold a substantial share in the future. The vertical segment is categorized into BFSI, retail, logistics, healthcare, government, IT and telecom, media and entertainment, travel and hospitality, and others. The BFSI segment is expected to witness significant growth over the forecast time period owing to its massive use in the banking sector. By geography, the global blockchain identity management market is divided into the Asia Pacific, North America, the Middle East and Africa, Europe, and Latin America. North America is anticipated to hold a significant share in the global blockchain identity management market owing to the high rate of penetration of these solutions in the U.S. and Canada. Some major players operating in the global blockchain identity management market are AWS, IBM, Civic Technologies, Bitfury, KYC-Chain, Factom, Oracle, Evernym, Inc., Netki, Inc., UniquID Inc., Peer Ledger, and BlockVerify, among others.